DERIVA provides client tools to upload data assets to a DERIVA deployment. DERIVA-Upload handles the movement of the data files. DERIVA-Auth provides an authentication token which is required when using the command-line interface. Although the process for downloading and running the above tools are different, they both use the same directory structure designed for different data types. The desktop client is convenient for data files that are on your local system and aren’t too large or numerous. The first time you launch deriva-upload (through the applications menu on Windows or MacOS, or with the deriva-upload command on Linux), the tool will ask you if you want to add a server configuration. Click “yes” to bring up the “Options” screen (you can also do this at any time by clicking the “Options” button at the top of the page). Click “Add” to bring up the “Server Configuration” form and enter the values provided by the DERIVA administrator. 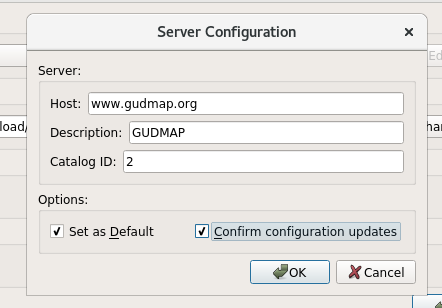 The following are example values for the GUDMAP/RBK deployment. In the main Deriva-Upload window, click the “Login” button at the top to log in. This will pop up a login dialog window. 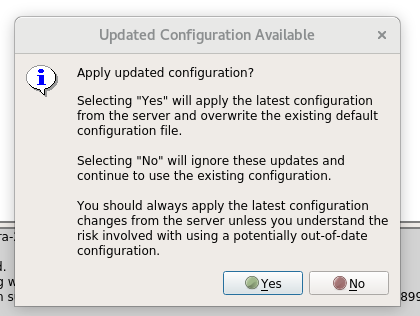 Once you’ve logged in, you may see a window notifying you that an updated configuration is available and asking if you’d like to apply it; you should click “Yes” to update your configuration and dismiss the window. Next, in the main Deriva-Upload window, click the “Browse” button and select the deriva directory you created above. You’ll see all the files you created, listed as “Pending”. Click the “Upload” button to start the upload process. The status of each file will change as it’s uploaded; for successful uploads, the status will change from “Pending” to “Complete”. Authentication tokens expire after 30 minutes of activity; you can log out explicitly by clicking on the “Logout” button at the top of the window. If your data is on a remote server and/or the data is very large or there are many files involved, you’ll want to use the command-line interface (CLI). Using the CLI on a remote server is a bit more complicated. First, you’ll need to get an authentication token by running the DERIVA-Auth tool on your desktop. Then you’ll run the command-line tool on the remote server. On your desktop system, install the latest version of DERIVA-Auth here (for Mac or Windows desktops) or here (for Linux desktops). Note: in subsequent runs, DERIVA-Auth might take you directly to this window (skipping the blank screen at the beginning). It’s always a good idea to look at the hostname before you log in. After logging in, you’ll see an “Authentication Successful” message. Click the “Show Token” button; this will bring up another dialog box to verify that you really want to view the token. Click on “Show Details” to display the token. /path/to//deriva is the path to the deriva directory you created above. Authentication tokens expire after 30 minutes of activity; you can log out explicitly by clicking on the “Logout” button at the top of the DERIVA-Auth window.